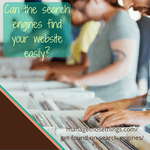 As a business owner you want your website to be found by the search engines don’t you? That’s the way you can get more traffic to your website, and more people can find you & become your customer. Are there any simple ways of getting found by the search engines? In short, the answer to that is, “no”. Many online marketeers will tell you that you need to employ them so they can do whizzy things for your site and improve your website rankings. However, whilst there’s no simple ways of getting found, there are some simple things you can do to ensure your website has the best possible chance of being found and ranked by the search engines. Even without technical experience, you can take control of your website and do these things yourself, without them costing you a penny. 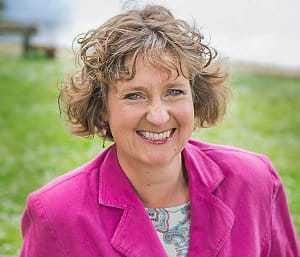 After my conversation with digital marketing expert, and website geek, Alison Rothwell, who helps website owners with their “fiddly bits“, I’m even more convinced that all business owners can achieve success with these 4 easy things. Ensure you have no broken links on your website. You can do this by checking your webmaster tools regularly. Use one key phrase for every page on your site. (Don’t use the same key phase again as it confuses the search engines). If you know your product and service, and you know who you’re target audience is, these words and phrases will come naturally. Add a meta title and meta description to every page of your website. 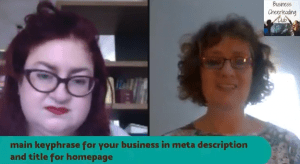 Alison explains in our interview how you can do this, but generally the website that you’re using will have a space or section for this information. If you use a wordpress site, the best way to do this is with Yoast or All in One SEO plugin. Each of these gives you boxes to complete with the relevant information. Add an alt tag and alt description to every image on your website. These alt tags should also use the key phrase of your page, so that it strengthens the search engines opinion that your page is to do with that particular key phrase. I learnt from our conversation that whatever platform you’re using for your website, you should have access to all the meta data you need to change it for every page. Alison suggested creating a template, then updating this for each page, to keep it simple for you. Especially if you need to go through every page of your website to check it’s correct! Another tip Alison shared was about using the “pipe” | key (we found this with the \ key on our keyboards). This creates separation in your meta titles and makes it easy for both the human eye and search engines to read. …often feels like searching for the holy grail! However, these 4 simple tips you can do yourself, are just a small part of the course we’ve put together for website owners. The course takes you through a ten step process, which you do at your own pace. You can upgrade the programme to include a website audit for our team to look at your website and give you recommendations which we will then work on together. Don’t be alone in worrying about your website not “doing it’s stuff”. Get the search engines to love your website with some simple steps you can do, without being an expert in web development or online marketing. Our Get your website working course is a perfect way to work through the different tips here and a lot more. Thanks Kevin. That’s a great tip, and one I know from my own experience to be true. I think that’s one of the hardest habits for any business owner is being consistent in all aspects of their business. Knowing it works helps to make it a priority! That’s great to hear Shelley that it works in practice. Many business owners, especially new ones question if it’s really “worth the effort”.